We’ve just returned from a family holiday in Brittany and it was lovely. The weather was good, the food was delicious and the wine flowed freely. We discovered that 1Euro bottles of red are perfectly drinkable, as are the 5 Euro (5litre) barrels of wine which were equally good to wash down masses of bread and coarse pate. 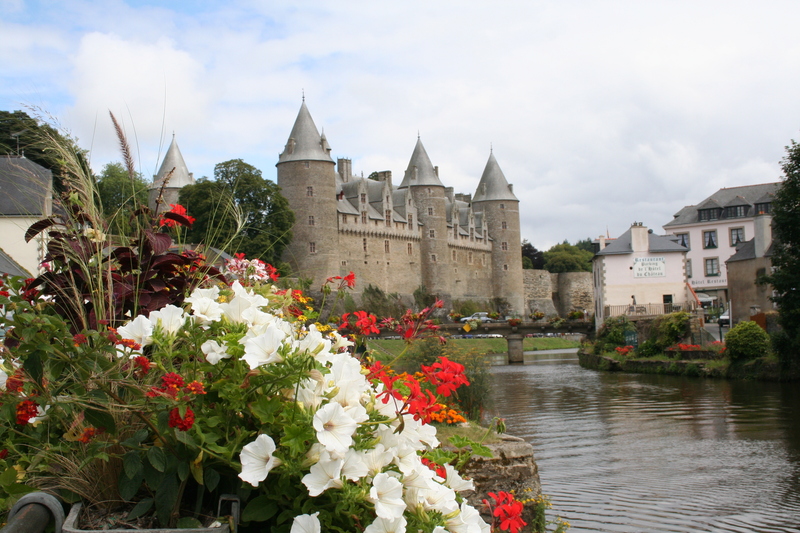 We stayed near a particularly beautiful town called Josselin, complete with picture-postcard castle (Le Chateau de Rohan) canal, cobbled streets and plenty of cafes to sit and watch the world go by. Bastille day was celebrated with an enormous medieval festival the whole town was decorated and everyone but the visiting tourists were dressed in medieval attire. As this was my first real holiday in France I was determined to make the most of all things French (not just wine and pate) so… food of the region as we were near the coast – Langoustines, Lobster, Oysters. I did eat a lot of Langoustines, they were on every menu and in every supermarket and I loved them, although a bit messy. Although we did find fresh live Lobsters in Vannes they were pricey and I’d rather a professional prepare and cook it, equally I chickened out on the Oysters, they just don’t look like your meant to eat them! I did however, and to my surprise eat a Snail. I wasn’t brave enough to order my own plate but I tried one and it was actually ok, a bit like a mushroom texture and tasted of garlic! After a week of relaxing and eating its been a hard week coming back to reality and the holiday blues have definitely set in as we’ve munched and drank our way through some of the reminders of France we brough home. Now I want to plan when we can go back!